on a night when she couldn't sleep. and her new bed was too big. The Beasties is the story of a little girl named Daisy who is afraid of being alone in the dark in her new bedroom. But soon the Beasties come and tell her stories to soothe her fearful mind. 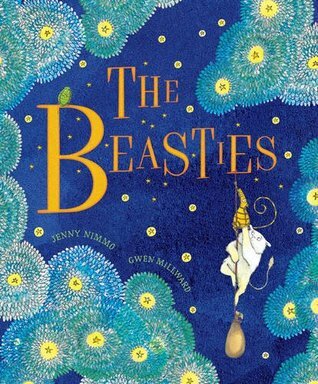 A beautiful tale about the power of story, The Beasties is the perfect picture book to read to a fearful child who doesn't want to sleep in her own bed at night. The lovely text by Jenny Nimmo paired with the dreamy Van Gogh-like illustrations by Gwen Millward would make this an ideal gift for any new mama-to-be. The Beasties themselves (Weevil, Floot, and Ferdinand) are absolutely precious characters that can work wonders at putting a child's mind at ease about what's really lurking under their bed. You think there's monsters under there? Oh no, it's just these little Beasties that want to tell you stories.